As we step into the era of personalized medicine, we need to characterize and validate novel cancer targets precisely – not just for therapeutic purpose but as diagnostic biomarkers. Our understanding of molecular changes in the pathogenesis of cancer has evolved rapidly. This has been harnessed in clinical context with new and improved diagnostic markers along with improved diagnostic methodologies. Cancer development and progression is accompanied by significant alterations in molecular signatures: DNA, RNA, miRNA and protein levels. As a tumor develops, it acquires characteristic molecular changes that impart its altered phenotype: survival capacity, replicative capacity, aggressiveness, invasiveness, and metastatic properties. These inherent biological alterations can be suitably harnessed to become targets for therapy or markers for diagnostic purpose. The tumor is no longer just diagnosed by morphology but by immunohistochemistry and molecular patterns – in a multiplex and high-throughput technology platform. Cancer biomarkers are of different kinds ranging from DNA, RNA, RNAi, and protein. Amongst the protein markers, there are immune molecules (ligands or surface receptors) that are expressed specifically in a cancer context, either in pre-cancerous cells or cancerous cells or in combative immune cells (1). These have been characterized extensively with respect to its biological property, clinical context, and its suitability as a therapeutic target or diagnostic/prognostic marker. Immune checkpoints are a class of regulatory molecules (stimulatory or inhibitory) that are significant in maintaining balanced immune homeostasis (2). Optimal immune response to pathogens and aberrant self-antigens is imperative to the survival of the host. The inhibitory immune checkpoints have been – in recent years - seen as promising molecular candidates for oncotherapy and as potential biomarkers for cancer. Some of the most characterized and clinically validated immune checkpoint molecules are listed below. PD-1 (in concert with PD-L1) - an immunosuppressive checkpoint (late immune response mainly in peripheral tissues). It is expressed on all immune-centric cells (activated T cells, B cells, NK cells). It associates with corresponding ligands PD-L1 and PD-L2 – these ligands are generally expressed on tumor cells in the tumor microenvironment - to inhibit T cell proliferation through distinct signaling pathways, to dampen cytokine release and reduce expression of survival proteins. Thus, the PD-1/PDL-1 interaction axis – in the tumor microenvironment - helps in evading anti-tumor responses and promotes cancer-associated immune suppression. PD-1 knock-out mice display symptoms of autoimmunity and cardiac ailments, although to a milder extent. CTLA4 - an immunosuppressive checkpoint (early immune response primarily in lymph nodes). It is expressed on naive immune cells (CD4 and CD8 T cells and Tregs). It associates with corresponding ligands CD80 and CD86 to negatively regulate T cell activation and dampens the signaling activity of the T cell receptor. CTLA-4 knockout mice display altered T cell infiltration in liver, lung, pancreas and are terminally ill by 3-4 weeks old. LAG3 - an immunosuppressive checkpoint expressed on immune cells (activated T cells and NK cells). It associates with MHCII to negatively regulate T cell activation. LAG3 knockout mice exhibit less pronounced effects. KIRs - an immunosuppressive checkpoint expressed on immune cells (NK cells, tumor-associated CTLs, and APC). It associates with MHC class 1 molecules inducing NK cell tolerance thus limiting NK cell activation against self-tissue. TIM3 – an immunosuppressive checkpoint on immune cells (activated T cells) and tissues (liver thymus, lung). It engages with galectin-9 and PS leading to decreased T cell proliferation and reduced IFN-gamma production. Cancer cells thwart host’s immune responses so as to mount an effective survival response. One distinct way cancer cells do this is to activate inhibitory immune checkpoints. Thus, it is noteworthy to investigate whether blockade of key inhibitory immune checkpoints could mount anti-tumor responses (2). Preclinical studies in mice indicated successful anti-tumor responses on blocking CTLA-4 checkpoint thus paving the way for clinical trials with this molecule. Different antibodies for CTLA-4 blockade in advanced stages of melanoma have been approved by USA FDA and EMA. Anti-PD-1 and PD-L1 (separately) therapy has been successful in recurrent or advanced stages of a wider range of cancer indications. Combination therapies with both the antibodies have also been approved in subsets of melanoma patients. Additionally, therapeutic antibodies recognizing IDO, GITR, LAG-3, 4-1BB, and TIM-3 are currently being tested in clinical trials. An excellent summary of the different recent and ongoing trials are tabulated (3). Immune checkpoint inhibitor therapy blocking CTLA-4 and PD-1 (and its ligand PD-L1) offer durable tumor regression across multiple advanced cancers (4). However, a substantial number of patients do not respond and additionally there is a diversity of responses across patients. Thus, it is essential to identify sensitive and specific biomarkers to diagnose, predict and monitor the outcome of the immunotherapy – especially so in combination therapy. Clinical and translational research studies have demonstrated that predictive biomarkers of response will be multipronged and are different between tumor types. Tumor cell interacts with the immune system in a complex and heterogeneous milieu that predicts the outcome of anticancer treatment. To decipher the complex code of cancer-immune interaction a framework of seven parameters was developed and named as cancer immunogram(5). Amongst the more generalized parameters like tumor mutational burden and the general immune status of the patient, expression of PD-L1 on tumor cells is one specific parameter. A range of solid and hematological malignancies express PD-L1, co-opting the PD-1/PD-L1 immune response checkpoint to evade the immune attack (6). Induction of PD-L1 can be due to oncogenic gene amplification event. However, in most cases, it is due to an immune resistance mechanism wherein PD-1 expressing T cells engage with PD-L1 tumor cells leading to IFNɣ release. IFNɣ receptor signaling in tumor cell eventually dampens this activated T cell response (6). 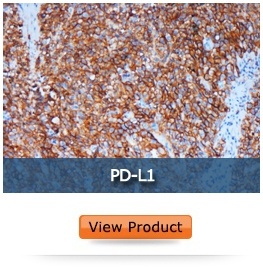 PD-L1 immunohistochemistry has identified a subset of patients (prospective and retrospective trials analysis) that would respond more to anti-PD-1/PD-L1 blockade treatment in melanoma, non-small cell lung cancer and bladder cancer. Those patients who have low or no PD-L1 expression on tumor cells still benefit from anti-PD-1/PD-L1 therapy, thus PD-L1 expression is not a good predictive biomarker for the outcome. Pembrolizumab was the first checkpoint inhibitor to be approved with the requirement for a companion diagnostic test to measure tumor PD-L1 expression for non-small cell lung cancer treatment. Nivolumab was approved with the first complementary diagnostic test to assay tumor PD-L1 expression in order to stratify patients with improved survival (although not a predictor of outcome). Sufficient variability has been shown in the predictive value of this marker. PD-L1 expression changes during the course treatment, hence the immunological and tumor profile need to be assessed at baseline. 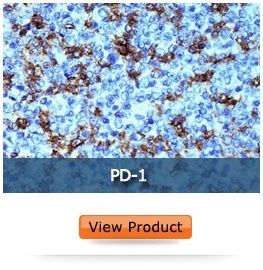 PD-L1-negative tumor staining is thought to be due to constraints in IHC assay and inherent variability in tumor samples. Four IHC tests have been approved by the US Food and Drug Administration (FDA) as either companion or complementary diagnostics for anti-PD-1/PD-L1 therapies. Further validation of PD-L1 biomarker studies in the contexture of tumor immune milieu is warranted either in mono or combinatorial therapy (13). However, the efficacy of tumor PD-L1 as pre-dosing or diagnostic marker looks promising. Studies are ongoing for emerging biomarkers for CTLA-4 and PD-1/PD-L1 immune checkpoint blockade therapies. However, unstandardized assays and variability in sample collection (plasma, serum or tissue) have stalled the rate of validation of biomarker candidates. High-throughput techniques along with more pre-clinical and clinical level research and analysis will be able to expedite discovery of novel diagnostic biomarkers as well validate them across large clinical settings. There is a substantial unmet need in diagnostic biomarkers: the large pipeline of immune checkpoint therapy will dictate the patenting of new diagnostic biomarkers. BioGenex is pleased to announce the launch of Anti-PD-1 mouse monoclonal antibody and Anti-PD-L1 rabbit monoclonal antibody for the screening of PD-1 and PD-L1 biomarkers respectively. BioGenex is offering these new antibodies in different formats: - ready-to-use (RTU) vials for manual staining and bar-coded vials for the i6000® and Xmatrx® family of automated staining systems. They are also available in concentrated format along with the antibody diluent and are also compatible with third-party detection systems. With our Super Sensitive Detection System, our IHC solution offers the widest portfolio with over 400 primary antibodies, reagents, consumables, and ancillaries. Finn OJ. Immuno-oncology: understanding the function and dysfunction of the immune system in cancer. Ann Oncol. 2012 Sep; 23(Suppl 8): viii6–viii9. Ribas A., Wolchok JD. Cancer immunotherapy using checkpoint blockade. Science 2018:Vol. 359, Issue 6382, pp. 1350-1355. Blank CU, Haanen JB, Ribas A, et al. CANCER IMMUNOLOGY. The "cancer immunogram". Science 2016; 352(6286):658-660. Patel SP, Kurzrock R. PD-L1 Expression as a predictive biomarker in cancer immunotherapy. Mol Cancer Ther 2015;14(4):847-856. Topalian SL, Hodi FS, Brahmer JR, Gettinger SN, Smith DC, McDermott DF, et al. Safety, activity, and immune correlates of anti-PD-1 antibody in cancer. N Engl J Med. 2012;366(26):2443–54. Herbst RS, Soria JC, Kowanetz M Herbst, Fine GD, Hamid O, Gordon MS, et al. Predictive correlates of response to the anti-PD-L1 antibody MPDL3280A in cancer patients. Nature 2014 Nov 27;515(7528):563-7. Taube JM, Klein A, Brahmer JR, Xu H, Pan X, Kim JH, et al. Association of PD-1, PD-1 ligands, and other features of the tumor immune microenvironment with response to anti-PD-1 therapy. Clin Cancer Res. 2014;20(19):5064–74. Meng X, Huang Z, Teng F, Xing L, Yu J Predictive biomarkers in PD-1/PD-L1 checkpoint blockade immunotherapy. 2015 Cancer Treat Rev 41(10): 868–876. Garon EB, Rizvi NA, Hui R, Leighl N, Balmanoukian AS, Eder JP, et al. Pembrolizumab for the treatment of non-small-cell lung cancer. N Engl J Med. 2015;372(21):2018–28. Brahmer J, Reckamp KL, Baas P, Crino L, Eberhardt WE, Poddubskaya E, et al. Nivolumab versus docetaxel in advanced squamous-cell non-small-cell lung cancer. N Engl J Med. 2015;373(2):123–35. Hansen AR, Siu LL. PD-L1 testing in cancer: challenges in companion diagnostic development. JAMA Oncol. 2016;2(1):15–6.